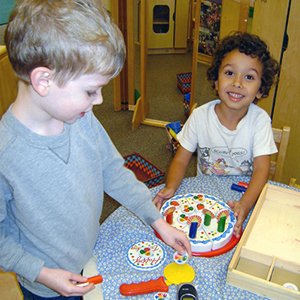 The Children's School's approach to preschool and kindergarten education is based on theories and research in Developmental Psychology, as well as years of successful practice. Our program is accredited by the National Academy of Early Childhood Programs, a division of the National Association for the Education of Young Children. How can my child attend the Children&apos;s School? What does the 2018-2019 Calendar look like? The calendar is available online or as a PDF. Why do you offer a 4/5 day preschool? Young children benefit from consistent routines, so attending an early childhood program on sequential days for more than half the week (Monday through Thursday or Friday) makes the home -> school transition easier than in alternate day programs (e.g., M/W/F or T/R) or programs with fewer sequential days (e.g., T/W/R). Many parents question whether their children will be uncomfortable away from home on so many days and whether they will be over-tired. Most are surprised to discover that the children beg to go to school on the weekends! Other parents are concerned that they will not have enough time to do informal educational activities with their children, such as visiting a museum or playing in the park. Again, most find that school holidays and other non-school times are sufficient for these activities, particularly as children mature and need fewer or shorter naps. Are there opportunities for mixed age interactions? We believe that both younger and older children have much to gain from mixed age interactions in a variety of contexts. In our preschool, 3 and 4 year old children mix at the Discovery Area centers and on the playground almost every day. At times, they also encounter each other in the children's bathroom and visit each others' classrooms. Preschoolers and kindergartners interact informally in the hallways and bathrooms, but they have no daily interaction time scheduled. Recently, we have been creating more opportunities for the older children to share their learning with the younger children, and vice versa, via visits to each other's classrooms to share songs, stories, and projects. How do you balance structure and choice? Balance is the key term in this question. Young children need clear and consistent structure in order to feel secure in their explorations, but they also need variety and choice in order to learn broadly and be creative. We begin each year with explicit discussions and demonstration of the daily routines in each classroom and behavior expectations that are consistent throughout our school. Children practice these until they are comfortable and essentially automatic so that they can devote their full attention and energy to the actions and interactions that will facilitate their development more deeply. During much of the day, children are invited to choose among a wide range of engaging activities at our learning centers. At other times, all the children participate in the same activity at the same time. For example, an educator leads circle time for the whole group, organizes a large motor activity in the gym for everyone, serves snack to the entire class, or takes the group to visit another area of the campus. Even during these whole group activities, children are invited to contribute their unique perspectives, dance in the way they choose, or indicate preference for one drink as opposed to another, as long as they are following the established routine and meeting the behavior expectations. This balance between structure and choice, together with explicit instruction initially and responsive feedback from educators, helps to prepare the children for similar balance in future schooling and life. Do you offer PreK or Kindergarten or both? The Children's School Kindergarten program serves as BOTH a pre-Kindergarten and a Kindergarten, depending on the age and developmental level of the child. Because our December 31st cutoff for enrollment contrasts with most other schools' September cutoffs, children with fall birthdays are typically too young to enter public, private, or parochial Kindergartens in the year they are turning 5. For these children, our Kindergarten serves as a pre-Kindergarten because they will enroll in the Kindergarten class of their chosen elementary school in the subsequent year. Many parents of children who turn 5 prior to September also choose to enroll them in our Kindergarten. Some are uncertain about placing their children directly into an elementary Kindergarten, so they stay in our program and postpone the decision about whether to do another Kindergarten year or go directly to 1st grade the following year. Still others are certain that their children will go directly to 1st grade after our Kindergarten but choose to keep their children in our program to allow additional growth prior to making a transition or simply because they want their children to experience the full three years of our high quality program. Occasionally, we have space in our Kindergarten for a few children from outside the school (i.e., who did not attend our preschool program). These children may fall into any one of the categories described above, depending on their ages and unique circumstances. Please stay in your car. The teacher will either get or deliver your child from/to the car. Please place your child’s car seat in the back seat, so that when you pull up to the door the child is sitting on the side closest to our building, under the awning. Do not allow your child to get out of the car seat while you are in the greeting or dismissal line. The Name Card found in your handbook is for the front dashboard. Clearly displaying this sign will help the teachers to quickly identify your car, thus making dismissal a smooth process. If you would like to park and walk your child into or out of the school, please use the parent entrance located near the visitor parking spaces. For safety reasons, do not walk through the parking lot by the awning while we are greeting or dismissing. If you arrive at school late, please walk your child into the classroom. If you are late picking up your child, you may park in the Margaret Morrison Visitor Parking Lot and come into the school. Please come to the school office where your child will be waiting and sign the “Late Dismissal” book. Please be patient and courteous while driving in our parking lot. Please drive slowly and refrain from passing. Please wait until the drop off/pick up spaces besides the wall and under the awning are free before pulling into these spaces. DO NOT BACK INTO THESE SPACES. It is difficult to get in and out of parking spaces while greeting and dismissal are occurring, so please take your time and attend carefully to the location of other cars. In order to avoid long lines and traffic “jams”, please drop off and pick up your child(ren) at their assigned times. If you arrive early to pick up your child, please wait in a visitor parking space until it is time. Otherwise you may be in the “wrong line” (e.g., afternoon preschool greeting and not extended morning dismissal). If we work together, then the system will run smoothly for all! Special note to families who are greeted at the Rotunda:  Please be sure that your child can easily exit and enter the vehicle on the passenger side of the car directly onto the sidewalk. It is a safety hazard to the adults and children to be in the street especially during winter months when the roads can be icy. Children who have car seats on the driver’s side of the car will need to be buckled by the vehicle’s driver and not the educator. The Carnegie Mellon Children's School offers parents a variety of ways to become involved in their child's school, to participate in activities focused on parenting, and to confer with the staff to build a strong bond between home and school. During the year, each teacher meets with parents to share information about the child at school and at home. Parents are welcome to observe from the observation booth in the preschool or the kindergarten observation window. Please check in the office before entering the school. If you need to talk with a teacher, please schedule a time either before (8:00 - 8:30) or after (3:30 - 4:00) school. All parents can observe their children on the playground from Dr. Carver and Mrs. Simpson's office or from the green room when a class is not in session. At the beginning of each school year, we ask that parents complete the "Parent Information Sheet". We will use this information to arrange meetings, compose committees, and schedule activities according to parent preferences as much as possible. Parents who are willing to volunteer in the classroom may make arrangements directly with the teacher. For your child's safety, dress your child with proper shoes - sturdy, closed-toe, rubber-sole shoes (no flip-flops, crocs, or clogs). Sneakers are the preferred footwear. For your convenience, please choose washable clothes. You may wish to send your child to school in layers (i.e., a sweater over a short-sleeved shirt) so that the child can self-adjust to the temperature of the room. Send an extra change of clothing for your child on the first day of school in case a child’s clothes become wet or soiled. Please include tennis shoes, shirt, slacks, socks, and underwear and label all clothes with your child's name. Remember to update this extra set as the weather changes and as your child grows! Provide adequate outer clothing for your child and label all items. We spend time outside every day, except in extreme cold or pouring rain. Our outdoor classroom and reflection garden both have areas of sun and shade, so providing clothes to layer for comfort is essential (5.A.07). In the winter, send boots, gloves, hats and snow pants. On snowy days, if children are not wearing appropriate outdoor clothing, the staff will limit their snow play. Pets are not permitted at school. Encourage your child to bring only books or CDs that are clearly labeled to share with the other children. Your child should leave toys, costumes, or other objects at home unless they have been approved by a teacher. Special toys often are mislaid and/or picked up by other children, causing upsets and disagreements that could have been avoided. We are fortunate to have access to many interesting facilities on the Carnegie Mellon University Campus and in Schenley Park. To take the best advantage of the last-minute opportunities that sometimes arise (e.g., hot air balloons on Flagstaff Hill or a robot demonstration), we ask parents to sign a permanent permission slip for on-campus and Schenley Park field trips. Teachers always notify the school office before taking children out of the school, always walk to their destination, and take walkie-talkies / cell phones and first aid / emergency backpacks with them. Occasionally, we schedule field trips that require longer walks (e.g., Carnegie Museum) or transportation (e.g., a theatre performance off campus). Parents are required to sign a permission slip for each trip individually and may be asked to pay a small fee for admission. At all times, we maintain a ratio of one adult to three children for preschool trips or one adult to four children for kindergarten trips. This ratio does not include student employees who may attend as extra helpers, though it can include student teachers. Siblings are not invited to attend field trips. The children are all assigned in advance to specific adults and all wear nametags with the school name and phone number on them. Adult family members are also recruited to drive for field trips because our teachers are not allowed to transport students in their vehicles. We are required to verify that all drivers have a valid license, as well as current car insurance. At all times when transporting children, all passengers are required to use approved child and adult safety-restraint devices in accordance with the manufacturer’s instructions. For kindergarten trips, we occasionally use a hired bus, in which case adults and children are required to follow the bus company’s safety procedures. For field trips, we use the dismissal and greeting procedure for the Children’s School parking lot to pick children up from and return them to the school (see Greeting, Dismissal, and Parking). Occasionally, because of time constraints, we may greet or dismiss children at the field trip destination. In all cases, plans and relevant maps are provided along with the field trip permission form. At the Children’s School, holidays are viewed as educational opportunities that give us the chance to learn about our diverse school community (3.F.03). As part of our emphasis on family identity and respect for diversity, we encourage children to talk about their family traditions, and we share stories and songs related to the meaning of holidays. We plan age-appropriate activities to involve the children in preparing for simple school celebrations and to help them contribute to family events (e.g., basic cooking, making gifts, and so forth). We limit our school celebrations to very brief spans of time (typically one day), attempt to maintain our regular school routine, and, as always, are ready to provide extra attention and comfort as needed. Because the children may prepare their own special snack related to holidays and because many children have dietary restrictions (especially related to candy and other sweets), please do not send any food as gifts for children. In all of these ways, we can create meaningful celebrations with the young children in our educational context. Birthday celebrations for young children at school can be a special time for the child to share with friends at school and, when possible, for families to join the celebration. Please contact your child's teacher when your child's birthday is approaching, in order to plan the timing of the celebration to best fit your schedule. For birthdays during vacation time, we celebrate a "half-birthday" as close to the half-birthday as possible. Because of the restrictions on foods brought from home for sharing with classmates, teachers will consult with the birthday child to choose a nutritious birthday snack that will then be prepared by a group of children in the class. We avoid foods with high sugar content, food additives or highly processed food, and we plan carefully around any food allergies that children in the group may have. Nutritious snack alternatives include bagels, muffins, pancakes, fruit, and frozen yogurt. Families are welcome to come enjoy the treat and often also read a book to the class. If you plan an additional birthday celebration outside of school time, please mail invitations from home unless the entire class is invited. 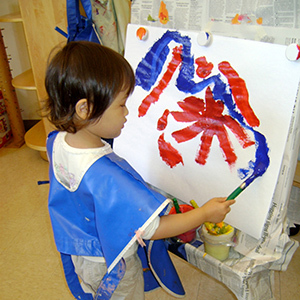 Our NAEYC accreditation and Pennsylvania licensing are limited to preschool and kindergarten children. Our staffing is set for the number of children in each class, and the classroom arrangement, materials, and routines fit the developmental level of the class. For all of these reasons, we cannot accommodate family requests for children’s siblings to join in classroom or outdoor activities. Siblings may accompany a parent or other caregiver to the classroom at greeting or dismissal time. We encourage siblings to participate in celebrating the birthday of a brother or sister, provided that a parent or other caregiver is present to supervise the child. We schedule several evening events during the year, such as Open Houses and the Family Festival, for families to attend together. Our annual Whole School Celebration is a wonderful opportunity for families to interact with each other and the staff. Also, Family Social Organization (FSO) events are often designed for the entire family. Educator / Parent Discussions are typically scheduled during times that allow us to provide child-care in the classroom designed for the youngest children. For parent meetings and conferences that involve the whole staff, we have neither the space nor the staff to provide child care. Please make other arrangements for all of your children during these events so that all staff and adult family members can give their full attention to discussing their important partnership. We announce our school closing/delay on both WTAE (1250 AM) and KDKA (1020 AM). We also inform the three local television stations of our delays/closings: WTAE, KDKA, WPXI. After calling the news stations, an Educational Administrator will send an email to our families. Families can also register for direct email notification from one of the station web sites. One Hour Delay - During a one-hour delay, we will greet the morning preschool classes and kindergarten at 9:30 AM. Dismissal will be at the normal times and the Extended and Afternoon Programs will be on normal schedule. Option #1 enables us to conduct the morning preschool classes, while giving our educators and families time for the road conditions to improve. Two Hour Delay/No Morning Preschool - During a two-hour delay, we will greet the Kindergarten Class at 10:30 AM and dismiss at the normal time. The Morning Preschool and Extended Morning Programs will be canceled but the Afternoon Programs will be on normal schedules. School Closure - Morning and Afternoon Preschool and Kindergarten are canceled. In all cases when school is in session, we encourage parents to use their best judgment about whether the roads in your area are safe to bring your child to school. Please be aware that the school district providing your bus service may issue a weather related delay or closing while the Children’s School remains open. This information is broadcast via local television or radio stations. Families may choose to bring the child to school or follow the school district busing plan. The Children’s School environment, schedules, routines, activities, etc. are all designed to foster positive behavior management. All staff members guide and support children throughout the day as they gain control of their bodies, learn to use language to communicate needs, practice persisting when frustrated, take turns, and play cooperatively with peers. Our rules and expectations are designed to help children learn to manage their behavior for effective interaction and cooperation. All staff members guide and support children by clearly communicating in a positive manner and tone. For example, "Let's keep the sand in the sand table so that we have a lot to pour." Typically, the children are eager to act appropriately and are recognized for doing so. We design activities that are age appropriate in both task and duration to maximize positive interactions. 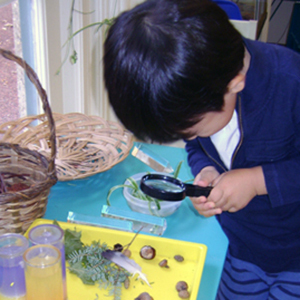 Our teachers also carefully monitor the children's activities to anticipate and diffuse problems before they begin. A child who is losing interest in one activity or getting too loud may be redirected to another area that can spark renewed engagement and positive behavior (3.B.05, 3.B.06, 3.B.12). Knowing and meeting expectations encourages independent action and fosters self- esteem. Put everything in its place. Provide limits in a calm, consistent, and respectful manner, which allows the child to grow in self-control and self-esteem. Respond to a child’s challenging behavior, including physical aggression, in a manner that provides for the safety of the child and the others in the classroom. Help children learn to identify both positive and negative emotions, as well as to express them appropriately. Work with children to develop conflict resolution skills necessary to solve their disagreements in an appropriate manner. Help children express and acknowledge their choices. Help children describe problems, evaluate their actions, verbalize alternatives, and consider the perspective of others. Children are guided and supported as they learn to accept the natural consequences of their actions. This approach includes positive reinforcement for appropriate behavior, redirection, reminders of classroom rules, modifying the classroom environment and/or daily schedule, and providing a supervised quiet time for the child to gain control. After a quiet time, the teacher invites the child to rejoin the group and reminds the child of the relevant expectations for the activity in progress (1.F.02). Staff shall observe all children and document any problem behavior to help ascertain any patterns re: events, activities, and interactions, as well as any precipitating contextual factors. If a child's behavior problem persists or becomes dangerous to the other children in the class (e.g., punching, kicking, temper tantrums), the teacher will bring the child to the school office to regain composure and talk with a member of the Administrative Team. Such situations are rare at the Children's School and are discussed thoroughly with the child, the teacher, and the parent to determine positive steps toward solution. Families are referred to specialists for help with persistent problems that may be linked to developmental issues, with the goal being to support the child’s successful inclusion in the classroom (1.E.01, 3.B.12b). So that teachers can focus their full attention on the children and keep their hands free for assisting them, we ask that adults who need to move car seats from one car to another (for example, when a parent brings the child but a nanny takes the child home) carry and install the car seats themselves. To make this a smooth process, families who need to make car seat switches should park in the Children’s School Lot and walk the child and his/her car seat into or out of the school. Injuries suffered while riding in cars are the number one preventable cause of death in young children. Please refer to the attached guidelines to keep your child safe in the car. Please note that Children’s School Staff members are not permitted to violate these regulations by buckling a child into an improper position or device. Never hold a child in your arms or lap while traveling in the car. Please do not take children out of seatbelts/car seats while waiting in the greeting or dismissal line. In the winter, special consideration must be given to the use of winter coats as the coat can impact the effectiveness of a harness-style car seat. Children’s School educators will remove a child’s coat prior to buckling the child into a harness-style car seat at dismissal time. During greeting, teachers will also help children to put on coats after removing them from their car seats. At all times, health and safety are top priorities at the Children’s School. Each individual’s vigilance regarding health and safety issues contributes significantly to our effectiveness. Always assume that you are the only one who notices a problem or potential problem and bring it to the attention of a staff person. Staff members are responsible for maintaining a healthful environment (5.C.01-04). We begin with our own health by submitting annual health appraisals and following even more strict illness exclusions than those required for children. All staff members submit criminal record and child abuse clearances as part of the employment process, as well as having periodic FBI background checks. We participate in an annual pediatric first aid / CPR class (5.A.03), a Bloodborne Pathogens class, the 5 R's of Medication Administration and Epi-Pen Use in Childcare, a fire safety class, and a review of our emergency procedures. Each classroom has a well-equipped first aid kit, as does the bathroom and outdoor shed (9.C.10). Each teacher has a backpack with basic first aid and emergency information that is used for all field trips, with additional supplies for emergency situations. We practice a variety of evacuation and lock-down drills, as specified in our Emergency Action Plan, in a serious but non-dramatic fashion with the children at a rate of one per month (2.K.04). Members of the Administrative Team conduct monthly health and safety checks of the entire facility, and we work with staff and university personnel to rectify any hazards identified. Staff members are responsible for daily checks of their classrooms and shared spaces for hazards such as missing safety covers on outlets, elevated water temperature in the bathrooms, insect nests or tripping hazards in the outdoor classroom, etc. The Children’s School is a smoke-free environment (9.D.06) with a safe water supply from the Pennsylvania Water and Sewer Authority (9.D.02) and heating, ventilation, and cooling systems maintained in accordance with national standards. Carnegie Mellon’s Environmental Health and Safety Department has abated all asbestos and lead from the Margaret Morrison building and does periodic checks for other environmental hazards (10.D.02), as well as diligently monitoring the status of our safety equipment and using an integrated pest management program (9.D.08). With the help of the university cleaning staff, we follow NAEYC’s frequency table for cleaning and sanitation throughout the school, including toys and water play areas (5.C.01,03). All staff members follow standard precautions to minimize spread of infectious disease (5.C.02) and store hazardous materials in locked cabinets (9.D.09). We follow parent and/or health professional recommendations regarding children who have allergies, and we limit classroom pets to birds, fish, amphibians, worms, insects, and small mammals with semi-annual vet checks. We use the Child Care Weather Watch chart to determine safe temperatures for outdoor play, as well as subscribing to an air quality alert system that provides notices of hazards in our area (5.A.07, 9.D.03). Our outdoor classroom always has shade available in the pavilions and play structures. During camp, when children are outside for a longer time and wearing bathing suits, we will apply sunblock with a minimum UVB and UVA protection of SPF 15 if it is authorized in writing and provided by the family (5.A.07). At this time, our area is not designated by health authorities as high-risk of insect-borne disease; but if that changes, we will use daily application of repellent containing DEET when parents provide written authorization and appropriate repellent (5.A.07). We are not permitted to apply a product that combines sunscreen and insect repellant (5.A.07). Because hand washing is the #1 preventive measure to avoid the spread of disease (5.A.09), we explicitly teach, scaffold, and monitor hand-washing procedures that involve the use of liquid soap and running water, with vigorous and thorough rubbing for at least 20 seconds (the length of the alphabet song, sung twice), followed by paper towel drying. We and the children wash our hands upon entry, before snacks and meals, before and after food preparation, before eating and prior to serving food to children, after toileting and diapering, after contact with bodily fluids, after play in the water table or with infants and toddlers, and after re-entry from the outdoor classroom, as well as after any messy activities or contact with pets. Adults also wash their hands after eating and prior to serving food to children, assisting with toileting, handling garbage or cleaning, and before and after feeding a child or administering medication. Visiting family members are asked to wash their hands upon entry to the school. The Children’s School contracts with outside agencies to provide vision screening and hearing/speech/language screening annually (4.C.01). Participation in this optional service requires permission from a parent or guardian, as well as a small fee determined by the agency. Suite 17 - Margaret Morrison Bldg.